When I first heard that America Needs Fatima had set a goal of 10,000 Public Square Rosary Rallies for 2013, I thought to myself that this was not just an ordinary crowd but a veritable army or brigade. The invitation to pray publicly for America’s future on such a massive scale enthralled me. When the number of rallies surged to over 11,000, I was awestruck. The idea of a brigade stayed with me in the days before the rally as I prepared myself to venture out into the public square. This was truly the Charge of the Rosary Brigade! Indeed, it would appear madness for a single individual to defy our culture and pray publicly in the square for America’s conversion. Now I was part of a whole brigade. Like the soldier that takes comfort in knowing he is not alone in the midst of the battle, so also I was comforted knowing that I was joined by others in my particular rally and yet hundreds of thousands more in 11,000 other rallies across the nation. With lines of Alfred Lord Tennyson’s famous poem, “The Charge of the Light Brigade,” running through my mind, I took courage, and on that October 12 morning, rode into the culture of death not with the six hundred but with the 11,000. Of course, there were obstacles to be confronted. True to Tennyson’s narrative, we also faced adversity. There were smirks to the right of us, insults by passersby on the left. Indifference scattered all about. But the conviction that I was with others only served to embolden me to surge ahead and pray all the louder. In such circumstances, I did not stop to think out each detail of our mission. We were focused on our great goal: to ask Our Lady’s intercession for all the moral problems we face. In the thick of our public square charge, ours indeed was not to reason why but to do and die as we defied the culture of death with the 11,000! 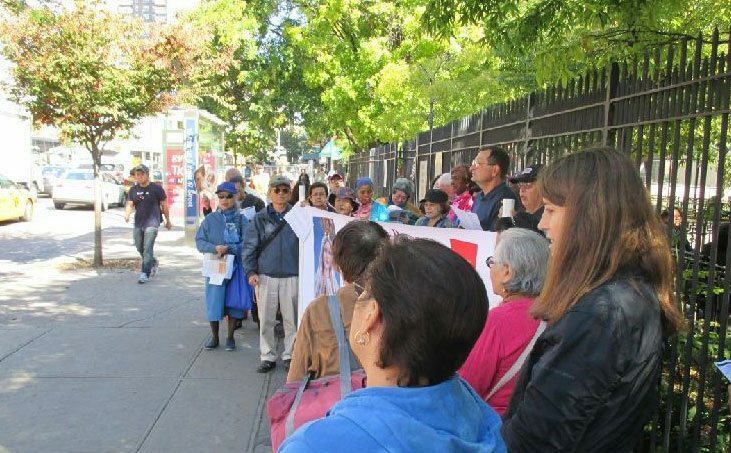 Public Square Rosary Rally on Tenth Ave. and 47th Street, New York City. My rally was a small one in the nation’s capital. It was but a small episode of the whole battle. We were situated on a busy intersection of Connecticut and Calvert streets. It was a trendy part of town with plenty of foot traffic yet full of those who hardly shared our perspective. We occupied one of “their” corners with our banner and standard. On the other side of the street, there gathered groups of people that formed what seemed like a “counter” rally of spectators who looked upon us with disbelief and even scorn. It was truly a test of wills taking place on that corner on a drizzly October day. Thousands of pedestrians and drivers witnessed this astonishing scene of bold witness. A few passersby broke ranks and joined us in prayer. Others walked up and encouraged us with exclamations of God bless you! But many showed disdain for our prayers, uttered gratuitous insults or feigned indifference. Ours was the task to endure ridicule and redouble our prayers as we defied the culture of death with the 11,000! 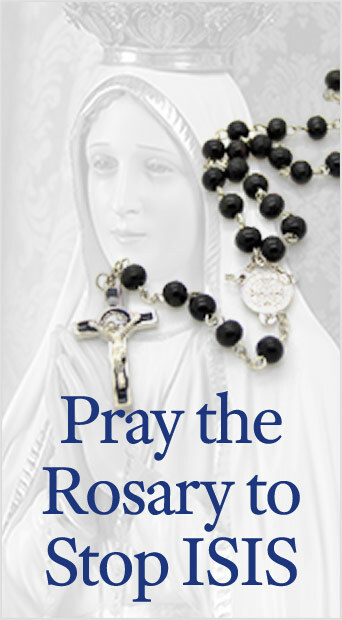 Decade after decade, we advanced our rosary, an act repeated across the nation. It was wondrous to be at that busy intersection. We were part of a huge brigade that stormed heaven with our prayers at this moment when our nation is full of great difficulties. We were those who grieved for the nation and sought heavenly solutions to our moral problems. We were honored to be part of those who defied the culture of death, broke through indifference and scorn, and presented our entreaties to the Blessed Mother. 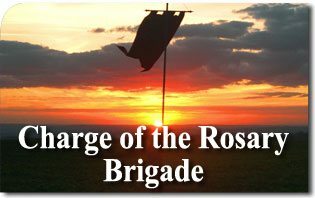 From this day forward, we can say we were part of the Charge of the Rosary Brigade – that noble 11,000! This entry was posted in Public Square Rosary by John Horvat II. Bookmark the permalink.